Doncaster Knights will be aiming to prevent top-four Championship rivals Yorkshire Carnegie from becoming the first side to do the double over them this season at Castle Park tomorrow (2.30pm). Carnegie were the last side to beat Clive Griffiths’ men in the league at Headingley in early October and will fancy their chances in the return after beating in-form Cornish Pirates at home on Sunday. The Welshman, whose side make the first of two trips to Cornwall in quick succession a fortnight tomorrow, took the opportunity to run the rule over both sides. “They are a very capable side and are a free-scoring outfit on their day and have been averaging nearly 40 a game of late,” he said. 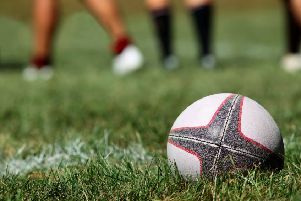 “A lot of their tries are from mauls but they can also score from all over the field. “We lost at Headingley but don’t forget we lost forwards Matt Challinor and Latu Makaafi and half-back Michael Heaney in the first half which meant we had to play Olly Bryant at 10 and he had only trained with us once, and still only lost by seven points. Former Rugby League star Kevin Sinfield could return to the Carnegie side after missing last weekend’s game with a calf strain. “I am hoping to be available for selection,” he said in midweek.